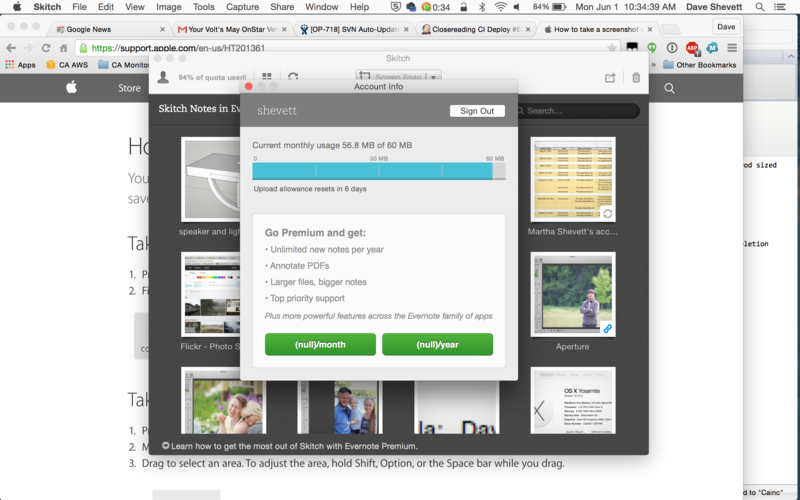 Dear @Evernote – This was a bad decision. – Planet Geek! Dear @Evernote – This was a bad decision. I’m a rabid user of Evernote and it’s associated screen capture tool, Skitch. I use it for just about everything, and regularly snap screenshots to share what I’m seeing with coworkers. 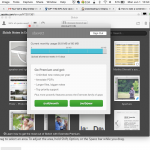 I’m aware that my screenshots are stored in my Evernote account, and there’s a disk space limit there. I’m okay with that, free services have to put limits on things. If I start running low on space, I go into my notebooks and start deleting things. Yesterday though, I was suddenly stopped from being able to share screenshots via an alert from Evernote that I was over my monthly upload limit, which would reset in 9 days. There is absolutely nothing to do to fix this except wait, or pay money to release it. This smacks of ransomware. My service has been interrupted unless I pay up, a service that up until now has been free. I have no way of ‘getting out of jail’ unless I cough up some dough, or wait over a week – and if I just wait, it may happen again next month. In addition, everytime Evernote tries to sync now, I get a modal dialog box that says “Cannot sync [Learn More]” – you can’t dismiss this box, you must click on Learn More, and get their little ad asking for money. Thanks guys. I’ve been considering paying for my Evernote Pro license, because I find the service quite valuable, but this… come on guys, this was a bad decision. You’re already limiting how much data I can store with the free version. Now you’re limiting how many I can upload, even though I have plenty of storage space? Ung. Changing Tides – Reworking my FB, Blog, Twitter Sharing. It does sound a little awkward. Is the monthly upload reasonably high? If so, maybe you should kick in a few bucks. Are they asking for too much? I know their technical operations guy. I can imagine they probably pour more effort into their paying users than the ones they need to cut off. It’s less that they asked for too much (like I said, Evernote is a great service, and I’m willing to pay for it). It’s the cutting off with no recourse that I object to. If you hit a disk limit, you can remove things and continue working. This sort of “you’ve hit the wall, you can no longer work” is really awful. Skitch is also configured to not allow sharing with any other hosted service, so either you set up your own SFTP gateway, or you have to copy/paste the image into Dropbox or something. Irritating.